I may have halfway stayed on task when it came to my personal resolutions, but when it came to my Red Cross resolutions, well, I'm not proud. Oh wait, I didn't. So don't. I haven't donated blood even once this year. I'm a good blood donor - the donation process is easy for me, I'm not afraid of needles or blood, and my blood type is A negative (regularly in high demand because it can be transfused to people with most blood types) - which makes my absence from the donation chair even more despicable. I was sick for the first eight weeks of the year so I kind of have a pass through February, but after that point my only excuse - and it isn't a good excuse - is that I was busy. Really, really busy. 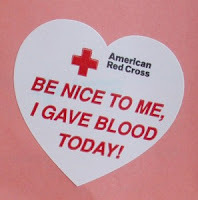 I'm hopeful, however, that I can donate blood while I'm in Wisconsin in July; I'll be staying at my parents' house so if I schedule my appointment with my mom's availability in mind she may be able to watch my kids for me. How well I did on this resolution depends on how you define an event. When I wrote the resolution I envisioned myself volunteering for parades and health fairs, as well as in the local chapter office, on a regular basis. I hate admit that I haven't been to a single event of this kind nor have I been to the office at all this year. That's not to say I haven't been volunteering, however; I find comfort in knowing that I volunteer for at least two hours each week - which means I've volunteered more than 52 hours already this year - researching and writing for the National American Red Cross blog. It's difficult to gauge my success on this resolution because I don't come home and make tally marks on a napkin every time I talk to someone about the Red Cross. I do spread the word though, at least once a week in my conversations with friends, and as often on Midwestern Girl when I provide links to the pieces I've written for the ARC blog. Whew! It's nice to know I've actually been keeping up with one of my resolutions. Organize at least one Red Cross-related activity for each of my children’s classes. I couldn't come up with a spring semester activity that was Red Cross-related, preschool-appropriate, and related to the units already scheduled in my kids' classes, so I'm planning a repeat of the Holiday Mail for Heroes activity I ran last November. Will's class LOVED making cards for United States soldiers and veterans, and I think that this coming holiday season I'll be able to bring the activity to both Will's kindergarten class and Hallie's preschool class. So there you have it, an update on my Red Cross resolutions. As always, I resolve to do better, but I also resolve to not beat myself up about only doing as much as is reasonably possible during this busy time in our lives. If you volunteer, how do you fit it in to your busy schedule? You are the best, Erin! The value you've provided to the blog has been outstanding.